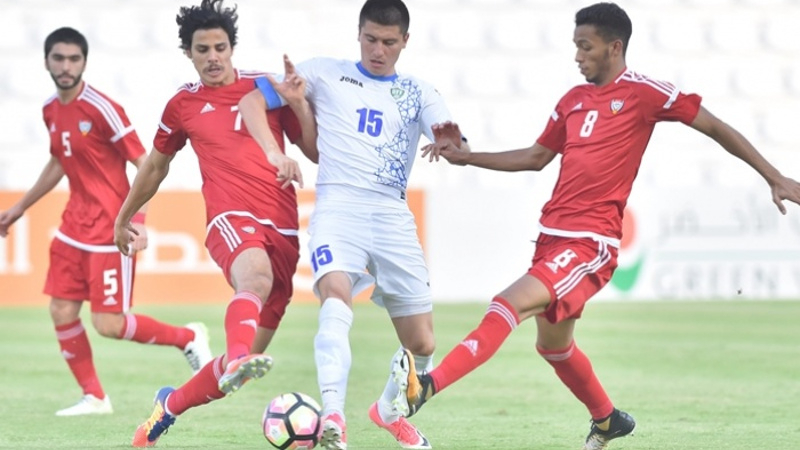 AKIPRESS.COM - Uzbekistan qualified for the AFC U-23 Championship after topping Group D with a 2-0 win over hosts UAE at the Tahnoun Bin Mohammad Stadium in Al Ain on Wednesday, AFC reports. Both sides were level on six points from two games coming into this third and final group fixture, but the UAE had an edge in better goal difference and knew they only needed a draw to progress. The UAE looked comforted by that fact until after the hour when Kobilov nodded in Jasurbek Yakhshiboev’s corner. A second was then added by Javokir Sidikov on 90 minutes. Now the hosts face an anxious wait to see whether they will still qualify for the Finals in China as one of five or six best runners-up. The best first half chance fell to Uzbekistan two minutes before the interval when Zabikhillo Urinboev’s header in from Akramjon Komilov’s cross was picked out of the top corner by outstretched UAE keeper Mohammad Busanda. Moments later Suhail Saeed took a swipe from outside the area that was punched clear by Uzbekistan keeper Botirali Ergashev. Sidikov’s free-kick sailed just over the cross bar after the break, and Mohammad Al Akberi tricked his way into the box but shot straight at the keeper up the other end before the hour. Urinboev was fed into the box from Islomjon Kobilov’s long ball forward but struck at the keeper after the hour. But from the resulting corner, Islomjon Kobilov headed in Yakhshiboev's cross for the opener on 67 minutes. Odiljon Xamrobekov could have added a second soon after when he was played into the box, but his chip back across goal only landed on the roof of the net. Ali Al Yahyaee’s header from Shaheen Surour’s free-kick glanced just over with 15 minutes to spare as the UAE tried to get back into it. But the victory was complete for Uzbekistan on 90 minutes when Sidikov smashed into the top corner from just inside the area.